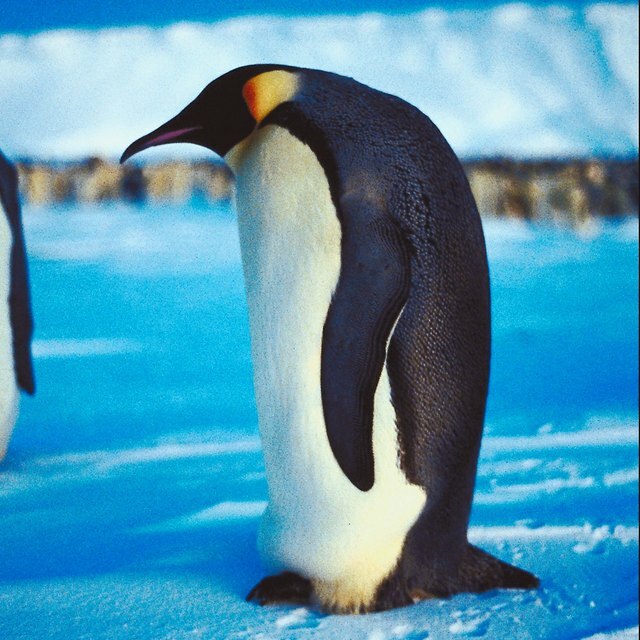 How Do Emperor Penguins Defend Themselves? From the Galapagos Islands to Antarctica, penguins encounter threats from predatory birds, marine mammals and sharks. Penguins in large colonies create a formidable defense against these predators by their sheer numbers, as do their swimming skills which include underwater maneuverability, swift exits from the sea and burst swimming speeds. The gentoo penguin, for example, can swim up to 22 miles per hour. The 17 species of penguins persist almost exclusively in the coastal Southern Hemisphere, with ranges including Antarctica, South America, Australia, New Zealand and South Africa. The exception is the Galapagos penguin, which is the only species that lives north of the equator. Regardless of geographic location, the tendency of most penguins to live in large colonies offers the protection of sheer numbers against enemies in the air, on land and under the waves, if only by providing a warning to other penguins that an enemy is nearby. Huddling together also discourages straggling from the colony and denies predators what would otherwise be an easy meal. The distinct black and white coloring of penguins is a type of camouflage called countershading, which helps penguins hide from predators and hunt prey. The countershading observed in penguins generally consists of black feathers distributed atop their heads, backs and flippers to help them blend in with the darkness of the ocean when viewed from above. With white undersides and underbellies, penguins blend in with the bright surface of the ocean when viewed from below. Depending on geographic location, on land penguins generally face the threat of predation by wild dogs, feral cats, rats and predatory birds like Arctic skuas and raptors. Although penguins walk slowly with a distinctive waddle and cannot fly away from danger, they can slide on their bellies -- tobogganing -- to flee their foes. When at the ocean's edge, tobogganing allows penguins to make a quick escape into the water, where they maneuver best. Penguins' ability to live in cold, inhospitable environments offers them protection against predators. Emperor penguins avoid land predators by breeding inland on the Antarctic continent, an environment too hostile for any land predators. Their physical and behavioral adaptations to the cold are evolved precisely for this reason. Penguins spend most of their lives in water and are exposed to a wide variety of marine predators, including sharks and large marine mammals like orcas and leopard seals. Porpoising is a technique that penguins can use to jump out of the water at high speed; When close to land, this technique can allow the penguin to escape from a marine predator and return to the safety of the colony. Additionally, although some penguins can achieve speeds of up to 22 miles per hour, marine predators like orcas are faster. To compensate, penguins use sharp, zigzagging turns to outmaneuver these larger and less agile animals. How Do Manatees Protect Themselves? Marker, Jonathan. "How Do Penguins Protect Themselves from Enemies?" Sciencing, https://sciencing.com/penguins-protect-themselves-enemies-4569925.html. 23 April 2018.